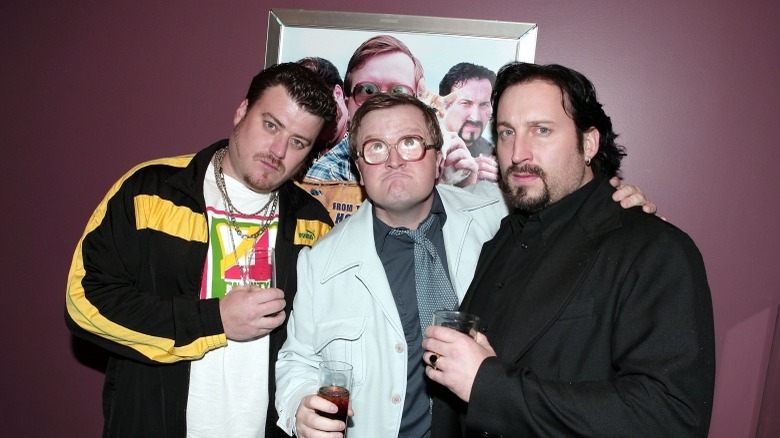 Since it premiered on an obscure Canadian cable channel in 2001, Trailer Park Boys has gone from an underground cult favorite to an international sensation, as audiences around the world warmed to the foul-mouthed antics of Ricky, Julian, and Bubbles. Often described as "the other side of COPS," the show adopted the "mockumentary" format years before the U.S. version of The Office (starting about the same time as the original U.K. version of The Office) and paved the way for "lowlife" comedies from Eastbound and Down to It's Always Sunny in Philadelphia. Here's the untold truth of how a bunch of friends from Nova Scotia changed the face of Canadian comedy. Instead of professional actors, many of the original cast were friends of creator Mike Clattenburg. 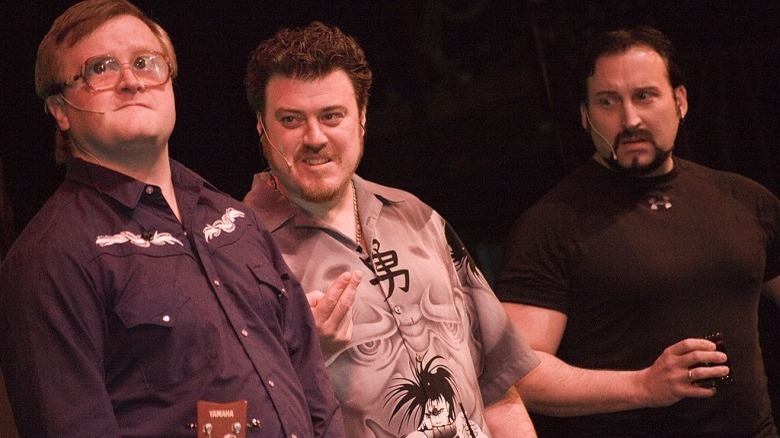 Robb Wells and John Paul Tremblay, who play Ricky and Julian, met Clattenburg in high school and went on to run a pub and pizzeria on Prince Edward Island before leaving to work on the show. Another of Clattenburg's buddies was Mike Smith, the guitarist for alt-rock band Sandbox. 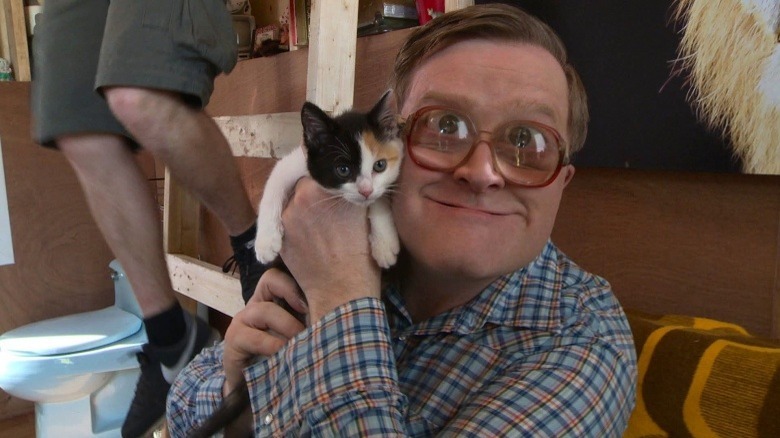 Clattenburg originally asked him to record the audio on an early version of Trailer Park Boys, but Smith was so funny on set that he was eventually added to the show as fan favorite Bubbles. John Dunsworth, who plays Jim Lahey, had the most experience out of the original cast, having worked steadily as an actor since the 1960s and even started his own acclaimed alternative theater. And Jonathan Torrens (J-Roc) was also fairly comfortable in front of the camera because he had previously hosted a teen-oriented talk show called Jonovision. 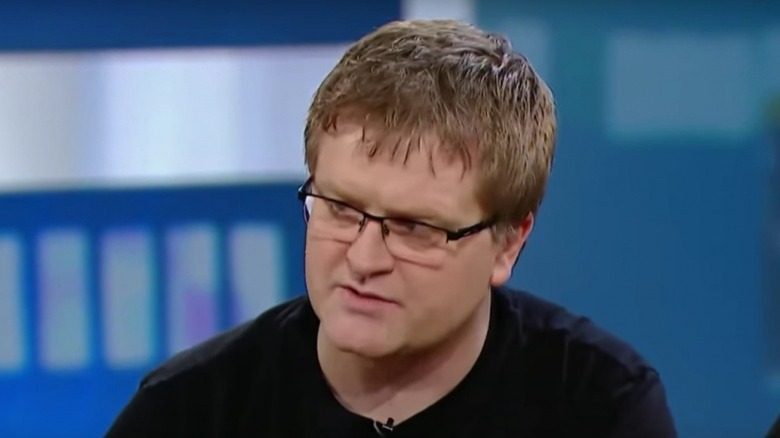 After an early career as a local TV producer in Halifax, Nova Scotia, Clattenburg shot a feature-length Trailer Park Boys pilot on his own dime. In 2000, he flew to Toronto to pitch the show to TV executives. Unfortunately, a mockumentary about a group of foul-mouthed petty criminals wasn't an easy sell. Every network gave him a firm no. Clattenburg had actually given up and was preparing to return to Nova Scotia when he decided to give it one more shot. He and producer Barrie Dunn cold-called Showcase, a relatively new cable channel that was still trying to find its niche. To their shock, the vice president of programming picked up the phone and they were in her office pitching the show in 25 minutes. Showcase loved the pilot, and the Trailer Park Boys series was given the green light. 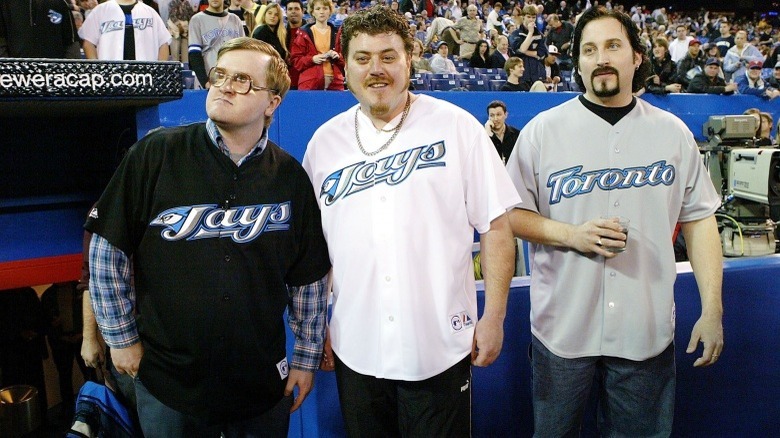 Trailer Park Boys debuted on Showcase in 2001, but it didn't exactly set the world alight in its first season. Michael Jackson, who played Trevor, says that one early fan organized a party to celebrate the show and the whole cast decided to go. Unfortunately, no one else turned up and the cast spent the night partying with their one fan. Fortunately, Showcase was a struggling young channel in need of content and played the episodes on repeat until they picked up a cult following. Something similar happened in America, where the show became an underground hit years before it was ever broadcast in the U.S., to the point that the cast members found themselves recognized everywhere when they visited Los Angeles in early 2004, despite the fact that the show had never aired there and DVDs weren't even officially on sale in the US. 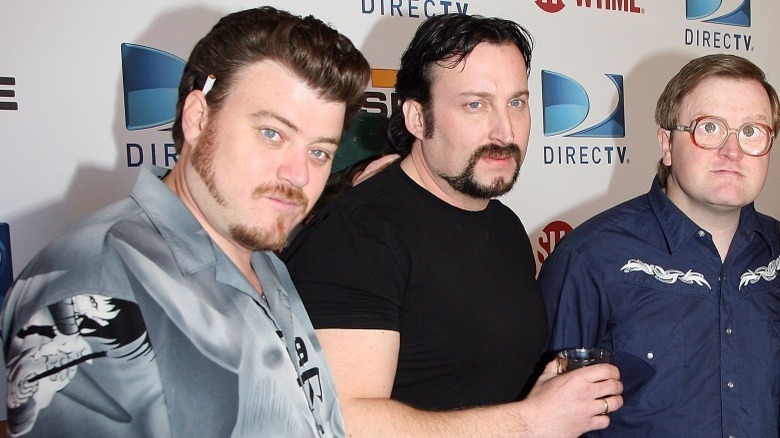 The main characters of Trailer Park Boys are known for their love of booze and weed, and their offscreen counterparts are no different. John Paul Tremblay has even claimed they came up with most of the ideas for the show after smoking a joint. 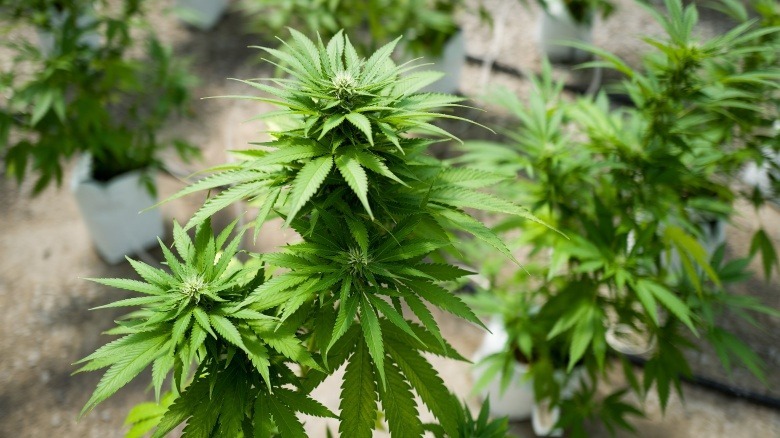 You can even look forward to TPB-brand weed, since the producers recently announced that they signed a deal with medical marijuana giant OrganiGram to launch their own line of products once recreational cannabis is legalized in Canada. However, the one thing they don't do is actually smoke or drink on camera, since that wouldn't be a great idea for actors working long days and doing multiple takes of most scenes. For smoking scenes, Robb Wells has said that they're often actually toking on rosemary. Before that, they sometimes used tobacco, but gave that up for health reasons. And the pot plants grown by Ricky are actually perfectly legal industrial hemp plants, which do not contain any THC. That said, you can spot real cannabis at least once in the series, with Wells explaining that "there was one time when we were doing bottle hits. They were trying to get this fake stuff to burn like hash and they couldn't find anything that worked, so I think they used real hash for that one." A major inspiration for the series was a short film Clattenburg made in 1998. The short, called One Last Shot, featured John Paul Tremblay and Robb Wells as early versions of Julian and Ricky. After a day of committing minor crimes, the short depicts the pair falling in love with each other and deciding to move to Vancouver. The film was entirely improvised on set and John Dunsworth apparently stole the show in his first appearance as Mr. Lahey, to the point that he nabbed a best performance award at the Atlantic Film Festival. Sadly, One Last Shot was never commercially released after its original festival showings, so almost no one has seen it. However, a Clattenburg short film called The Cart Boy, featuring an early version of the Bubbles character, was eventually released as an extra on some Trailer Park Boys DVD collections. Mike Smith's Bubbles quickly became the show's breakout character, with his friendly attitude complemented by a pair of adorably thick glasses, which are actually older than the character. When Mike Smith was still a professional musician, his girlfriend went to Texas to visit family and wound up at a local flea market, where she spotted the glasses among the effects of an elderly woman who had just died. Since she only had 50 cents, she had to leave a framed picture of the woman behind, which Smith still regrets. Smith loved the glasses and would put them on to amuse friends, which was the origin of the "Bubbles" character. 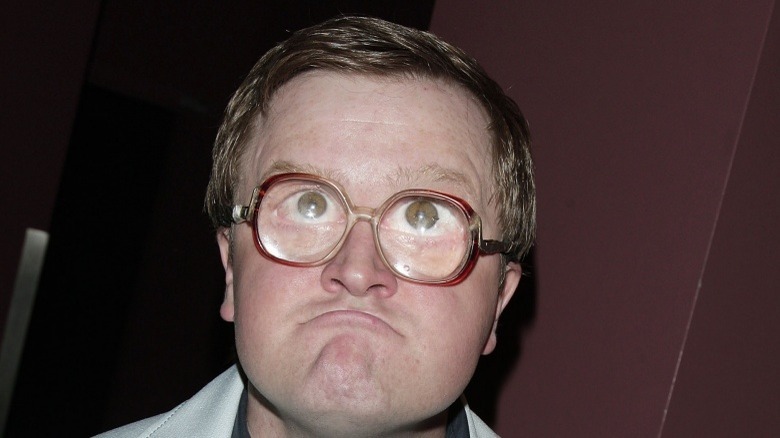 Of course, when Bubbles became a regular on Trailer Park Boys, Smith had to start wearing the glasses for longer periods, which originally gave him a pounding headache. Luckily, he's now at the point where "my brain turns off my eye pain somehow." After four classic seasons, the actors who played Cory and Trevor left the show, complaining of low pay and poor working conditions. Cory Bowles eventually returned as Cory, but Michael Jackson refused to make another appearance as Trevor, posting that he felt "ripped off financially" and "disrespected as an actor and as a person." According to Jackson, he worked for the minimum actor's equity pay for the first three seasons, then received only tiny raises despite the show's growing popularity. By Season 5, friends who appeared in commercials were still making more than he was. To make matters worse, the producers repeatedly lied to him and the other actors about other actors' pay, refused to hire a proper film crew, and provided unsanitary bathrooms and trailers. John Paul Tremblay, who writes for the show and plays Julian, later hit back at Jackson on a Trailer Park Boys forum. According to Tremblay, "the grass always looks greener on the other side" but he and the other writers actually made "pennies an hour" and "took tremendous risks, left good paying jobs and decided to take a chance at doing something we strongly believed in, for next to no money at all." Fans love Bubbles for his gentle, childlike nature. So there was shock in 2016 when Mike Smith was arrested in a Los Angeles hotel and charged with domestic battery against a woman named Georgia Ling. But the situation was apparently more complicated than the initial headlines suggested, and the charges were quickly dropped. Ling later released a statement insisting that "Mike and I did indeed have a heavy argument, but … at no point did I feel I was in danger, otherwise I would've called the police myself, which I did not. The police were called by others not present in the room who mistakenly perceived the argument to be something other than what it was." The incident was complicated further when actress Lucy DeCoutere, who plays "Lucy," announced that she was leaving the show over the incident, tweeting that "If I find out that somebody is abusive, I cut them out of my life. It's very easy." However, the show's publicist contradicted this claim, insisting that DeCoutere had informed producers she was quitting weeks earlier. DeCoutere later suggested that the whole thing had been a misunderstanding, declaring that "the TPB cast and crew are still my friends and there are no bad feelings between us." During their recent live tour, the boys earned some extra cash by having Julian invite fans up on stage to buy cheap hamburgers for $10 a pop. The burgers were often cooked live on a George Foreman grill, later revealed to have been stolen from shirtless cheeseburger addict Randy. At other shows, the "Julian Burgers" were reportedly just McDonald's cheeseburgers wrapped in paper. Fan reviews claim they "tasted like disappointment." The boys did come in for some criticism for cashing in on their fans. A VICE reporter estimated that Julian raked in at least $1,500 at a show in Oakland, with drunk and stoned audience members queuing up on stage to buy the burgers. In an interview to promote the U.K. leg of the tour, John Paul Tremblay insisted that the stunt "wasn't a scam! Those people got their cheeseburgers!" During at least one later show, the burgers were replaced with "Julian Chips," which were just Walkers' Crisps with a "J" drawn on the packet. After over 10 seasons, multiple movies, an international live tour, and numerous minisodes and specials, the boys could be forgiven for wanting to take a break. But aside from a few minor quibbles (Robb Wells and Mike Smith have moaned about keeping the same terrible haircuts for well over a decade), they show no signs of slowing down. The stars have spoken about their desire to become a Canadian Coronation Street (a British soap aired regularly since 1960), with the characters growing increasingly decrepit. As the boys told Metro News, "it's funny to watch the characters get older … where 20 years from now you see Ricky, Julian and Bubbles who are in their late 60s. 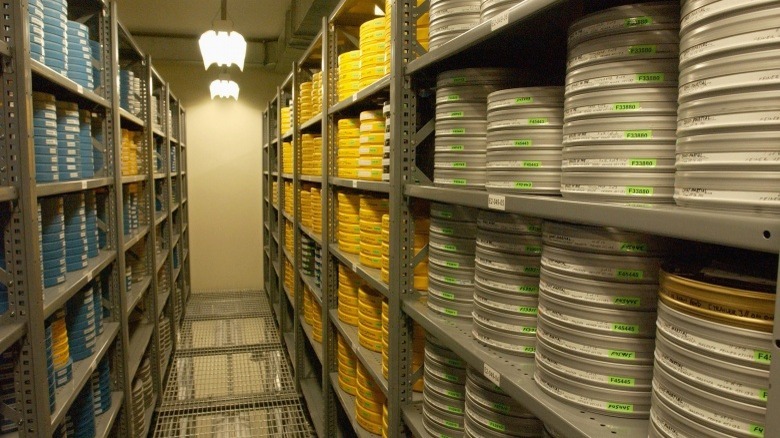 … We want to continue shooting until our fans say 'Guys, it's time to shut it down.'"